The chance to vet Pfizer’s $106 billion offer for rival drug-maker AstraZeneca looks too good to pass up for China’s competition watchdog. Pfizer should brace for some antitrust therapy, though getting Astra’s board on-side first may help. China can review any formal proposal for a tie-up between the two drug-makers, even though neither is Chinese. Jurisdiction hinges on whether each makes over $64 million annual revenue in China, and both clearly do. AstraZeneca made $1.8 billion sales in the People’s Republic in 2013. Pfizer doesn’t give detail, but just the growth in its Chinese revenue in the last three months of 2013 was above the filing threshold. MOFCOM is unpredictable, mostly because its merger control rules are new – they were only instated in 2008. Delays are also likely. The regulator is burdened with the planned mergers of advertising agencies Publicis and Omnicom, and materials makers Holcim and Lafarge. Judging by published approvals, the average wait time is already 200 days. MOFCOM can also ask parties to refile well into the review process to buy time, and seems to prefer opining after EU and U.S. watchdogs. The chances of China killing off the deal are minuscule. MOFCOM has only blocked one case and approved hundreds without conditions. Most decisions have been reasonable. In judging Pfizer’s 2009 purchase of Wyeth, MOFCOM worried the combined company would dominate sales of a vaccine for pig viruses. After Pfizer offered to divest its Chinese animal vaccine business, approval was granted. Some surgery on this tie-up, if it happens, is almost certain. China is sensitive to keeping prices low for consumers, and the companies specialise in fighting rich-world diseases like high cholesterol and diabetes which are growing with China’s waistline. Overlaps could worry authorities. Pfizer says its cholesterol-lowering drug Lipitor is number one in China. Astra’s similar Crestor is a top global seller. One way to mitigate that would be proactively suggesting remedies or divestments. While Astra’s board refuses to talk, that will be tough. Pfizer might be wise to increase its proposed offer to secure an Astra board recommendation. That could minimize the inevitable immune response. 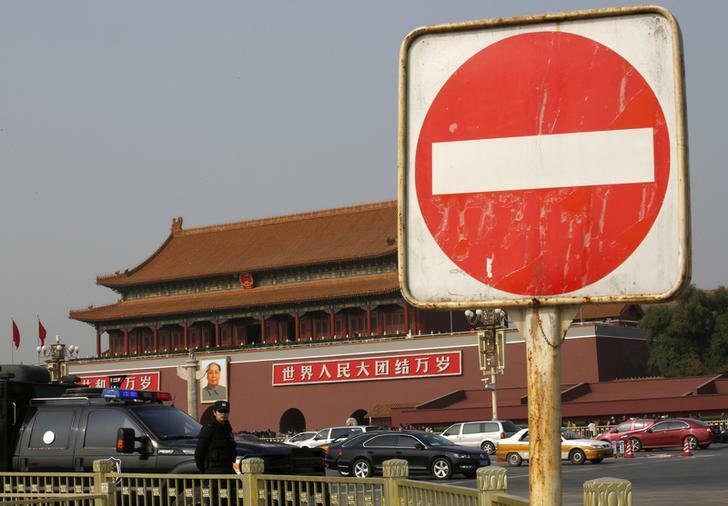 A sign is seen next to a policeman of the Special Weapons and Tactics (SWAT) team standing guard in front of the giant portrait of Chinese late Chairman Mao Zedong, on Tiananmen Square in Beijing October 30, 2013. AstraZeneca laid out its defence against rival drug-maker Pfizer’s $106 billion takeover approach on May 6 by predicting its sales would rise by three-quarters over the next decade, although only after a short-term drop. The proposed offer would value AstraZeneca at 50 pounds per share, comprising 1,598 pence in cash and the remainder in stock. Under Chinese antitrust rules, any two companies that each make over 400 million yuan ($64 million) in sales in China, and whose combined sales are over 10 billion yuan globally, or 2 billion yuan in China, must seek merger approval from China’s Ministry of Commerce (MOFCOM). MOFCOM imposed conditions on Pfizer’s $68 billion merger with Wyeth in 2009, requiring the divestment of its RespiSure animal vaccine business in China to a local group. For the quarter ending December 2013, Pfizer said operational revenue in its emerging markets segment increased by 9 percent year on year to $2.75 billion. The group said that was primarily due to volume growth in China.